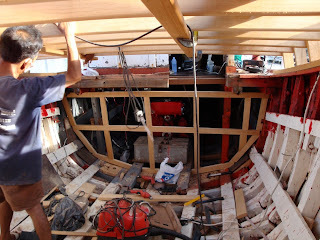 Here is the start of a big change to the boat - the addition of a bulkhead. This is to create an engine room separated from the rest of the boat. Up till now the boat has been completely open inside from bow to stern with no attempt to enclose the engine space or contain noise and heat. As there will be sleeping accomodation in front of this bulkhead there will be insulation added later on the engine side.